Electronic book readers turn every book, magazine and newspaper into large print. Whether it is the Kindle reader, the Apple iPad or the Barnes and Noble Nook, all of these e book readers offer font magnification along with other easy to use features. Find out what each one has to offer and how you can enjoy reading once again. An e book reader incorporates features like reduced glare, crisp clear letters, bold black fonts with good contrast and font magnification. 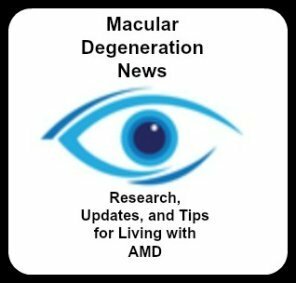 The best e book reader for someone with low vision or macular degeneration is the one that offers the largest screen size and the most options for font magnification and contrast. This low vision technology is also a wireless reading device. Meaning it runs on a battery and needs no wires and no computer is needed to download ebooks. You can take this hand held device anywhere - it is totally portable and lightweight. Put it in your purse or take it with you traveling. 5. Easy to use. Navigate with touchscreen or easy to use buttons. 6. Read or listen to your book - if you get tired of reading simply press a button to listen to your favorite book on the Kindle reader or download audio books right to any of the e book readers. 7. Less expensive to download the ebooks than it is to purchase large print books. 8. Free wireless access without the need for a computer. Download books, newspapers, textbooks and magazines right to the wireless reading device. 10. A Color Screen is available on the Apple iPad, Barnes and Noble Nook, and the Kindle Fire. 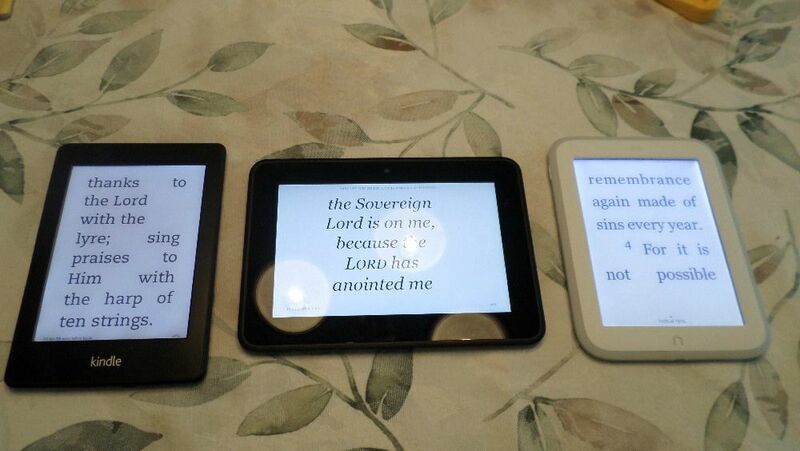 On the left is a Kindle Paperwhite, the middle reader is a Kindle Fire and on the right is the Barnes and Noble Nook. All of them are on the largest font size. Electronic readers require either a WiFi hot spot or a cell phone signal. The ones that use a cell phone signal make it easy to buy and download a book almost anywhere, anytime. Sometimes a little too conveniently for book lovers like me :). There is no monthly charge or service fee, but usually the devices that use a cell phone signal cost more than those that just use a WiFi hot spot. The Kindle Paperwhite has a 6" Diagonal Screen with a back light that provides some of the best contrast by simply adjusting the brightness. It is easy to read for long periods of time without eye strain and it can be read outside with no glare. At night, adjust the glow so it's brighter - which means you don't need a lamp or clip on light to use it. An easy to navigate Touchscreen and a glare free screen makes this black and white electronic book reader a favorite for those with macular degeneration. You are not able listen to books on this device. For some reason Amazon does not include the power adapter - it has to be purchased separately. There are several versions, the latest being the All-New Kindle Paperwhite which has the highest resolution and provides the best contrast and clarity. 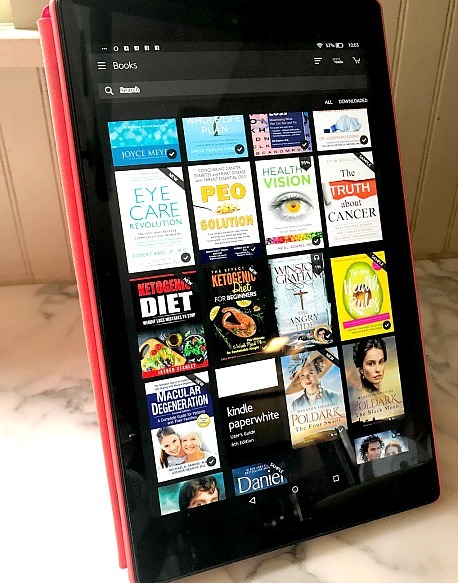 For those who want a color screen, listen to audio books, surf the web, get emails, or watch movies, the Kindle Fire provides all of these options. The colors are so vivid on this screen, it is truly amazing. If you like to read magazines and enjoy the colored pictures that go along with them - this is a great way to go. It comes in several screen sizes with the largest at 10". If you get tired of reading you can listen to many books through Kindle Unlimited or through Amazon's Audible. You can try the reader before you make a purchase by going to a Barnes and Noble store. Once you make a purchase you can get in-store help to assist with any questions or concerns on how to use it. Some stores offer classes to teach you about all the different features from navigating the e-reader to obtaining books from your local library. Free books from your library can be downloaded right to the device. No need to get to the library to get a book or return it before late fees start to add up. 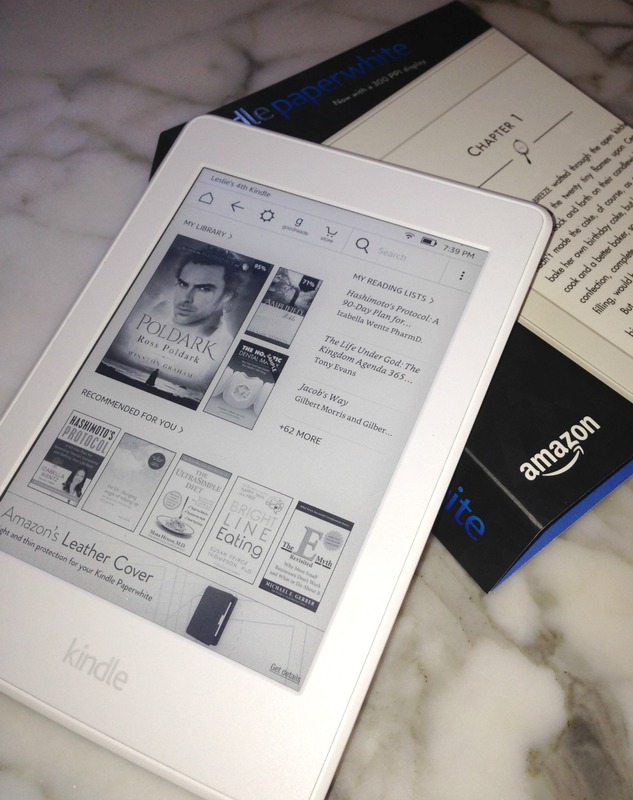 The black and white Nook GlowLight is comparable to the Kindle Paperwhite. It has the adjustable back light which means it can be read outside or by a bright window with no glare and it can be read indoors in the evening without a lamp or clip on light. It's lightweight and can be held easily and comfortably for a long read. An easy to see and use touch screen means you can move to another book quite easily. The cost is close to that of the Amazon PaperWhite. 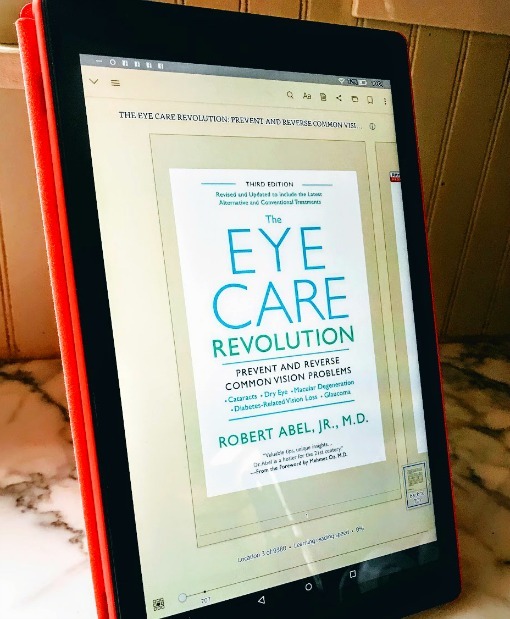 Not everyone with macular degeneration can use or benefit from this technology, which makes it nice to try out the Nook at a Barnes and Noble store before buying it. Just go to the information desk and ask for a demonstration. Want to try a cheap, actually free, ebook reader? Did you know that you can download the Kindle app for free? Now, you may not want to read an entire book sitting at a desk at your computer, but if you have a laptop or tablet, you might want to consider using the Kindle app as an e book reader. Even though I own a Kindle, I have the app on my iPod, my iPhone and my iPad. The best e book reader just might be your own computer with it's nice and large monitor screen. Download the Kindle reader software for free and have your favorite ebook delivered right to your computer. No need to buy any Kindle or wireless reading device. I have done this on my computer. You have access to all the Kindle ebooks and free ebooks. Here are some benefits to reading using your computer screen. Your Kindle Reader can enlarge the fonts and adjust the line spacing. There are 12 options to magnify the font. If you need the largest font magnification you will also need the largest viewing screen and a desktop or laptop computer has a larger screen than does any of the Kindle devices. The Kindle screens range in size from the smallest at 6" for the Kindle Paperwhite to the largest being the Kindle DX or Apple iPad at just under 10". Be sure to check the option to use the full screen on your Kindle software for reading your books. √ Search - Find a word or a sentence in the book you are currently reading. Once you download the Kindle for PC to your computer, you will find in the upper right hand corner where you can "Shop in Kindle Store" Click it and you will be taken to Amazon's Kindle Store. Select the category of books that you would like on the left navigation bar - i.e. non-fiction - and then sort by Price:Low to High. Many categories offer free books, some do not. You can also just perform a search in the Kindle Book store using the key words "free kindle books." This will also help you find a free downloadable ebook. The classics provide the most free Kindle books. Amazon has a great page that lists other websites where free ebooks can be found as well. 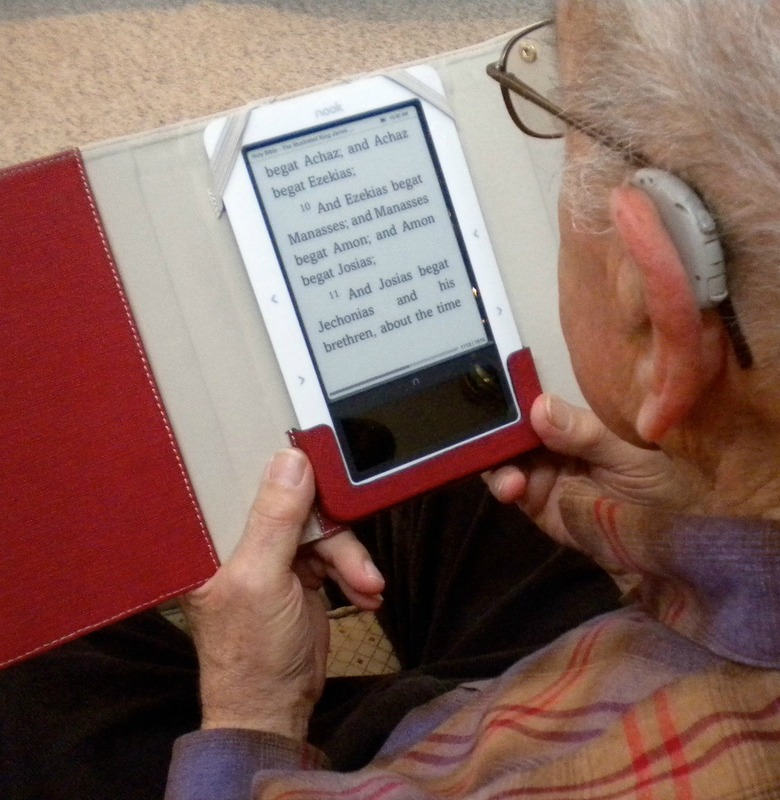 Electronic book readers make it possible to read for many people with macular degeneration. 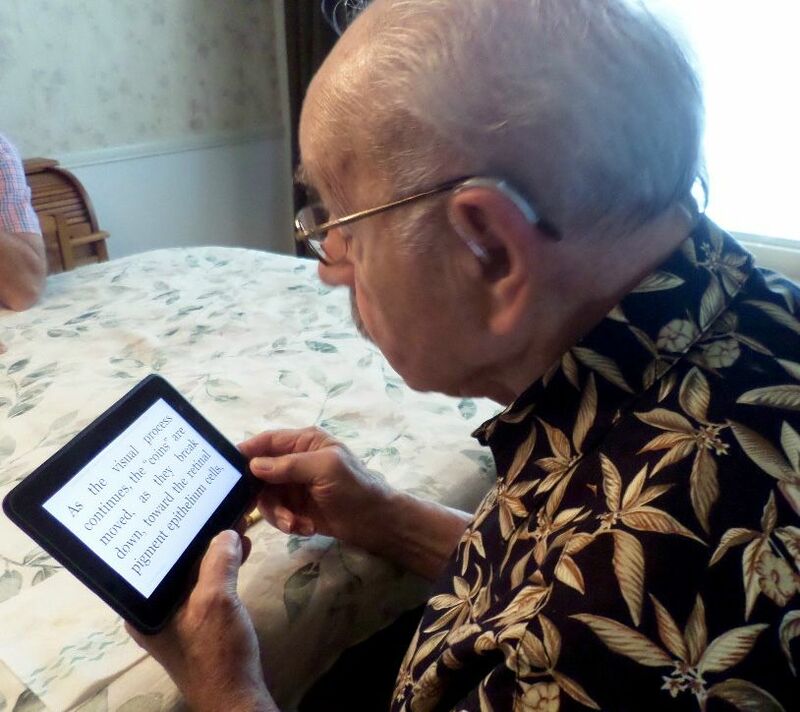 My father-in-law at 89 years old with wet macular degeneration reads daily on his Barnes and Noble Nook. Try an e-reader today and find that reading is not only possible but enjoyable.